If your Sweet Corn or Green Bean operation is ready for the advantages of mechanical harvesting, now is the time to take advantage of special discounts and our lease to own program! See the brochure for details. 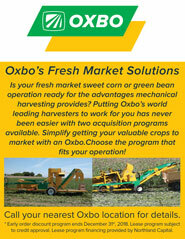 Click on the video here to see Oxbo’s BH100 green bean harvester and CP100 Sweet corn harvest in action.